If you’re looking for the perfect ‘gift that keeps on giving,’ look no further! You’ll find it right here! 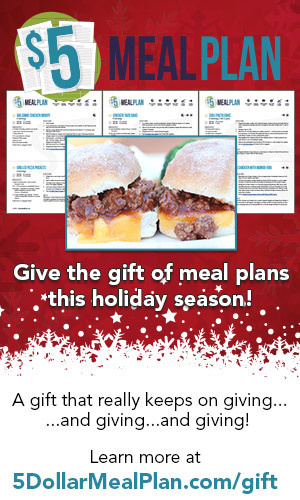 Give the gift of meal plans, delivered to your aunt, cousin, friend, each and every week…right into their inbox! The gifting option for $5 Meal Plan is only available to free trial members and subscribing members. Payment can be made with paypal or credit card. You can gift the 6 month or annual subscriptions. Head on over to 5DollarMealPlan.com/gift to get gifts lined up for your family and friends who desperately need help in the meal planning realm!